Inside the "One-Stop Shop of Literary Greatness"
But FSG has long represented at least the idea of an alternative. As chronicled in Hothouse, FSG stood by its “eggbound” writers—Kachka’s term for those suffering from writer’s block—long after other publishers might have written them off. And despite Straus’s metaphor, FSG departed and continues to depart fairly consistently from the adversarial trend. “At Knopf and Farrar, Straus we liked our authors,” says editor Henry Robbins, a Knopf and FSG veteran quoted in Hothouse. Judging by the vivid account of FSG’s history given in this book, a decided predilection for authors has been what has distinguished the house that Kachka claims, convincingly, is a “one-stop shop of literary greatness,” consistently nourishing the talent it has brought into the fold and demonstrating a legendary knack for getting talented authors for peanuts. What Kachka doesn’t say—but which seems implicit, given the current publishing climate—is that this just might be the new normal when it comes to the survival of a house. Now that publishers have cut advances almost across the board, FSG fits right in. Roger Straus was something of a visionary in his hands-off style of editing, given the rarity today of the editor who actively works on a manuscript—as opposed to managing it.1 Putting aside his early, admittedly nonliterary career, when he did some heavy lifting while working for the Navy’s publishing arm as a book packager and sold downmarket blockbusters, the only book he seems to have actually edited was Sammy Davis, Jr.’s Yes I Can. Davis—whom Kachka somewhat offensively describes as “shuffling, cowering”—was brought to Straus by agent Carl Brandt in 1965.2 Brandt knew Straus’s commercial instinct would not allow him to reject the book. Yet getting it into print was an ordeal, starting with the ghostwriters, who objected to Straus’s foul mouth. Like most of Straus’s gambles, this one paid off: The book was a number-one best-seller and garnered a front-page review in The New York Times Book Review. Newsweek called Straus a “marvelous editor”—a nod that editors seldom receive, then as now. Yet there is no further mention of anything done by Straus that can be called editing, leaving to others in the firm the “care and feeding” of chosen FSG authors. Jonathan Galassi and Susan Sontag. At the same time, Straus played an important impresario role: He showed consistent foresight in recruiting literary talent from around the globe and creating an intensely literary climate at FSG. He found that prestige was compatible with paying out small sums to writers; in fact, the succès d’estime was a FSG specialty. Straus’s genius in spotting new writers and his dedication to the writers he chose to take up, is everywhere evident in this book. Two other independent publishers, Grove Press and New Directions, both went after undiscovered international talent in the postwar period, often successfully. But it was Straus who made the most spectacular showing in this sweepstakes, snapping up major foreign writers and publishing them often. He started with the Italians: Cesare Pavese, Carlo Levi, and Alberto Moravia. Later, such writers as Carlos Fuentes, Pablo Neruda, and Aleksandr Solzhenitsyn joined the list. Many of these authors eventually won the Nobel Prize. Editor Jason Epstein says in Hothouse that Straus chased Nobels: They brought prestige and—because the prize sold books—money. And, of course, they made his writers happy. Succès d’estime was a FSG specialty. An essential feature of the literary environment Straus fostered at FSG involved cultivating what Kachka calls a writer confidant. Fuentes was one of the first; he helped Straus identify rising literary stars in Latin America; writers like Joseph Brodsky and Tom Wolfe also alerted Straus to new talent. Edmund Wilson was the earliest of these figures—Straus said his idea of the best way to promote a book was for Wilson to discuss it at a dinner party—but the most prominent, and arguably the most influential, was Susan Sontag. She appeared at the firm’s offices in 1965, a darkly attractive, verbally dexterous 29-year-old. All she had to offer was a partially written, decidedly second-rate novel, but Straus was charmed instantly and would remain in thrall for years (if they slept together, it was at the beginning, Kachka believes). The publisher’s care and feeding of Sontag included promoting her unceasingly, pushing her early books abroad, getting articles published for her, and, not least, inviting her to his famous parties. When she was away on highly paid lecture tours, FSG would handle her mail, find someone to check on her apartment, and sometimes pay her bills. Eventually she delivered with a string of books that earned the firm critical and financial rewards. Roger Straus speaking at FSG's fiftieth-anniversary celebration. 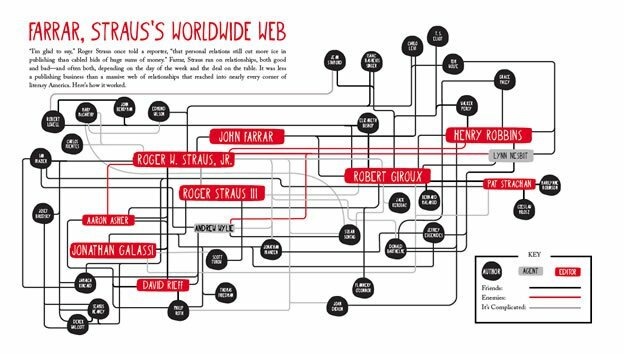 Even though Farrar, Straus was sold to German conglomerate Holtzbrinck two decades ago, it has managed somehow to retain the character of a midsized independent publisher even as the identities of many other publishers have been subsumed by the conglomerates that own them. But whether it still deserves the prestigious reputation that Roger Straus earned for it is left unanswered by Hothouse, which mostly sticks to description of current operations rather than any kind of value judgment. But in these dishy accounts of recent events, one can sense a certain concession to the forces of marketing. Novels are packaged and served forth as persistently as Twitter feeds; the goal seems to be to get in the face of the reader who is distracted by all manner of stimuli. Kachka suggests that Jeffrey Eugenides, Jonathan Franzen, and Thomas L. Friedman—all edited by Jonathan Galassi, who replaced Bob Giroux in the role of discerning and brilliant editor—represent FSG’s idea of the new cultural order, and his account of how the books of these new favorites are edited and promoted, in particular, dwells on the details. FSG chose to promote Eugenides’s latest novel, The Marriage Plot, with a billboard in Times Square featuring an image of the goateed and middle-aged writer, strutting toward the viewer with his vest open to the breeze. (To his credit, Eugenides was “a little shocked” at this PR move. "Would Samuel Beckett do it?" he asked himself.) Kachka reports in detail the embarrassing debacle that ensued when Franzen publicly expressed chagrin over The Corrections being named an Oprah pick in 2001. When Franzen returned to “Oprah” to promote his next novel, Freedom, his tail between his legs, Kachka describes how he was primed with “FSG-funded media training.” New York Times columnist Thomas Friedman is included on this roster as a representative of FSG’s nonfiction chops. If Friedman, essentially a popularizer of think-tank messaging, is the best we can do in the way of a public intellectual, we are distressingly philistine. Thomas Friedman is no Edmund Wilson. Still, few can say that FSG has abandoned its writer-friendly practices. It has carved out a niche as a home for the “serious” writer. But in this tarnished age of American publishing, these are “old media” values—barely relevant now. No amount of care and feeding of authors has much bearing on the question of the consumer’s attention. FSG is going to have to continue to evolve, and it’s not clear whether the house has the flexibility and vision to do so. Brandt told Kachka that the combination of Straus and Davis still made him laugh.